Explore the peace and power of God’s playground on foot and by boat. 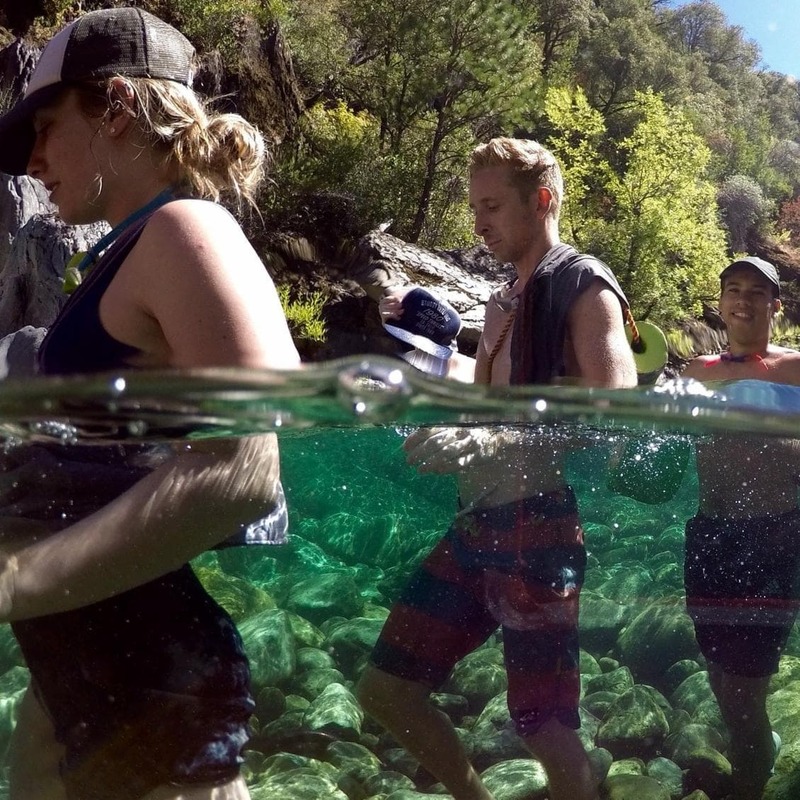 We’ll spend 1 day of Class III river rafting on the South Fork of the American River and 1 day of canyoneering. 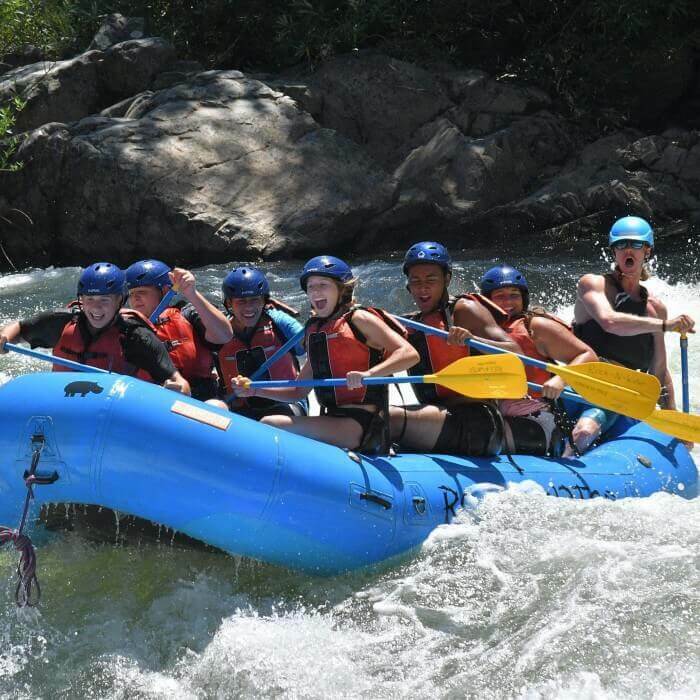 High school groups can upgrade to 1 day class IV California rafting on the Ruck-A-Chuck for an additional $32/person. You will find that in everything we do, it is to build an environment where youth can meet their creator in the outdoors. The challenge of canyoneering and the teamwork of whitewater rafting are amazing opportunities to help them learn more about God and connect with each other. 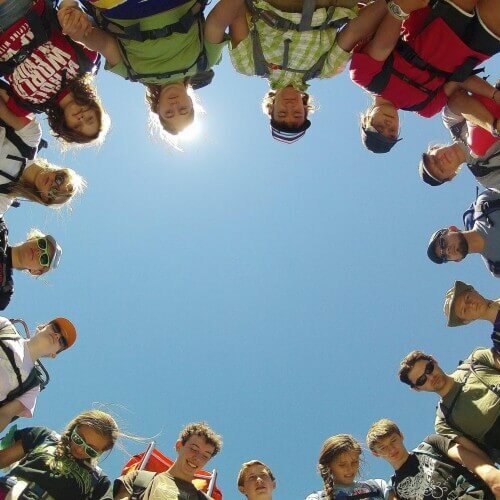 Among other things your group will take part in quiet times, campfires, climbing, exploring, and rafting. 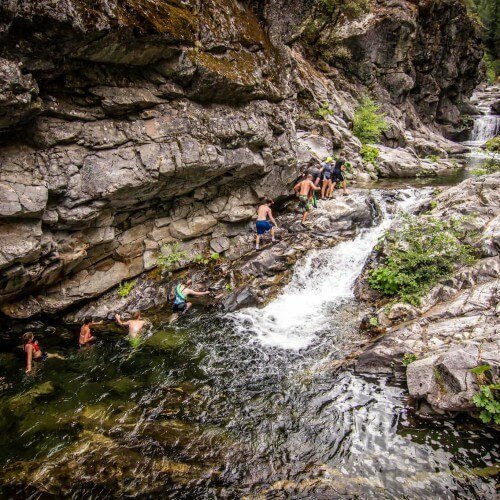 The Canyoneering trip exceeded our expectations. Natasha and Caleb were awesome! 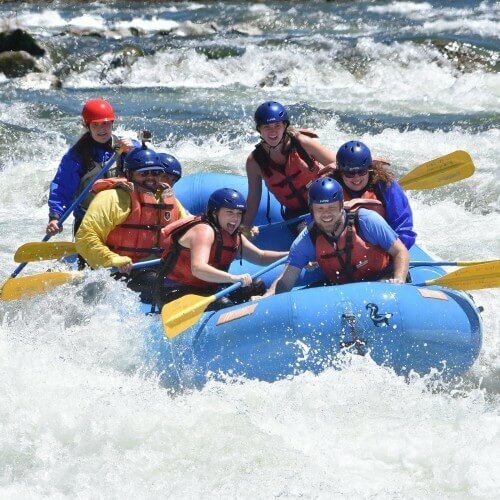 Our group didn’t expect to have so much fun on this excursion, but we are glad we went with this option along with the white water rafting excursion! People were really welcoming and the whole camp was a really nice environment. Loved it! Can’t wait to come back. This was an amazing trip that I would definitely recommend to everyone and I would for sure come back every summer if I could. It was also awesome due to our guide, Natasha. She was a fantastic guide but her kindness definitely made her feel more like a friend. I can’t wait for next year! Had a great time! Enjoyed the preaching, and being on the water was great. Enjoyed my guide too. I had a great time with friend, and everything felt pretty well done. Amazing! Joshua was a world-class guide and did an amazing job. Canyoneering and rafting was a great experience and was organized so well. Loved every minute of it. The guides were fun and knowledgeable. Everyone of our group (24 people) loved it. I plan on coming back next year. This is my second time going to Rockneater and I look forward to taking my family to camp each time. The guides were great and the kids loved them. My kids really bonded with the guides and they look to them as examples. I would recommend this camp to anyone who loves the Lord. Thank you. My family and I had the best time at Rock N Water. Our tour guide Joshua was amazing. He not only kept us safe but also poured God’s love out into my kids. We highly recommend Rock N Water and can’t wait to return! I almost died! These huge boulders were falling down the cliff side. It was so loud, it sounded like thunder. I jumped out of the way. I was in awe, not only because I was alive. But I was amazed of how amazing God. He created everything, and this camp, you can really praise God in all His glory of what He made. As I was praying, and thanking God for not letting me die. It reminded me of Philippians 1:6. This camp made me see things different, that God is God. I’m for sure coming back! I can’t wait to bring my wife, and show her where I almost died. P.s. I forgot my horseshoe puzzle in 2014. Hopefully it’s still there. It was awesome! Everyone I met and talked to was incredibly nice. The camp itself was really cool, and the activities (river rafting, canyoneering) were well-lead and exciting. This is the second time I have been. I have loved the leaders and the whole experience with the students in a much less structured atmosphere. The campfire times with the students and leaders have been real and honest. Pretty impressive! Really like it. We had a super time and thanks to y’all for being so thoughtful and detailed in all phasss of our trips and events (from the unexpected rock-climbing, canyoneering, evening campfire worship time led by your staff as well as the white water rafting and rock jumping) not to mention the yummy food.Thanks for a memorable 4th of July weekend! Very nice, unforgettable wonderful experience. Warmhearted persons with high professionality. I loved the camp. Every one is full of personality and character! Our experience at Rock N’ Water was amazing. The staff there were so kind, the adventures were really fun. It was pretty hot when we went, but the cold water makes up for it. It’s so beautiful. The food was AMAZING as well. 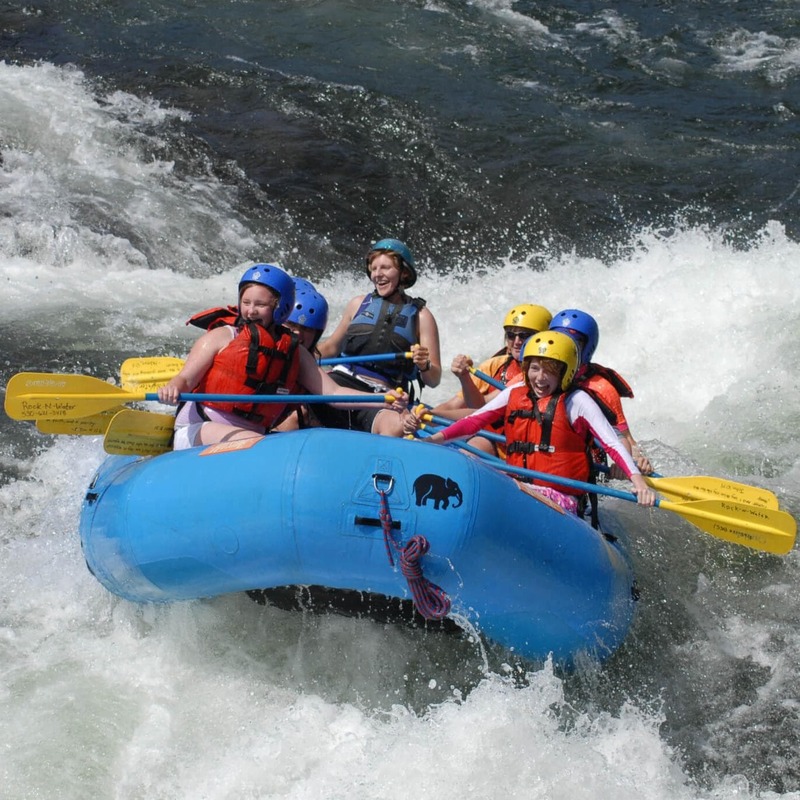 Rafting is definitely the highlight of our trip. Would definitely love to go again. We always have such a wonderful experience at Rock-N-Water. The staff is so amazing, fun, Christ-like, and friendly! The activities are incredible, exciting, and beautiful. The food is also sooooo good. As long as we are able, we will keep coming back here every summer. 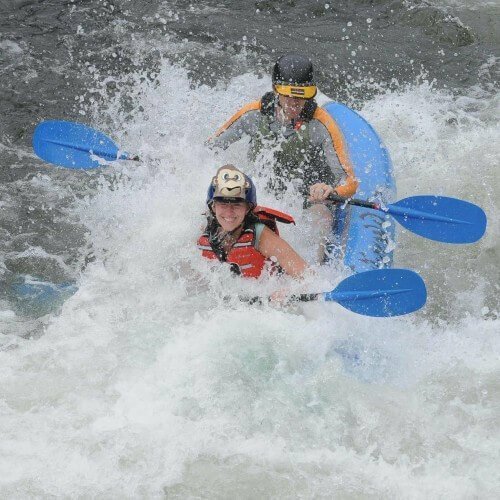 Rock-N-Water was the most incredible experience I have ever had. You can’t truely feel Gods presence and fellowship with those around you. I had an incredible time up at Rock N Water! The staff there are so sweet, and so down to earth. I love the structure of the camp; very laid back and open. I went as a leader with my group and felt so at easy knowing my students were truly being cared for.This was my second time going as well, and I found that every time I go, I become more and more impressed with the camp. As strange as it may sound my favorite part of the camp itself are the bathrooms! XD Each stall is unique and has verses on the doors that are encouraging and bring peace of mind. Thank you Rock N Water for the amazing experience, I hope to come back soon and be blessed by your joy. It was a super great experience. We saw some of the most beautiful places and we did many cool activities. Food was great too. Instructors were really awesome and helpful with everything too. Just all around a good place to enjoy the best outdoor activities. I had a very enjoyable time with my friends and camp guides. They made me feel very at home and allowed me to have fun without worry. very good experience. tranquil time with Nature and the Lord, and fun time in the water. I loved going to RnW!!! I have been there few times already, with the youth group, with my family, twice and last years Marriage Retreat. I love the staff, the food and the location. My experience with you guys have always been excellent! You guys rock!!! God Bless! I really enjoyed the cliff jumping and the group activities and making new friends, The praise and worship team was excellent too! Each time we have gone to Rock N Water we have had a great time. It has caused us to draw closer to our God and closer to each other. I have a great experience and I will never forget! I absolutely loved this experience. I don’t think that anything could’ve made it better that is according to me. It was very fun! The staff was so helpful, and the kids had a great time with them! It was a great help to have a safe environment to bring our youth so we could focus on meeting God. We have had nothing but great reports about how kids lives were changed. Definitely a must! Amazing! Delightful! Challenging–in a great way! The staff was competent, approachable, caring, encouraging, and patient. Loved the campsite…great location and layout. Pleased in so many ways. Our trip had a great time. Your staff is wonderful. Stuart did a great job keeping the youth focused on the positive side of the challenges they faced. 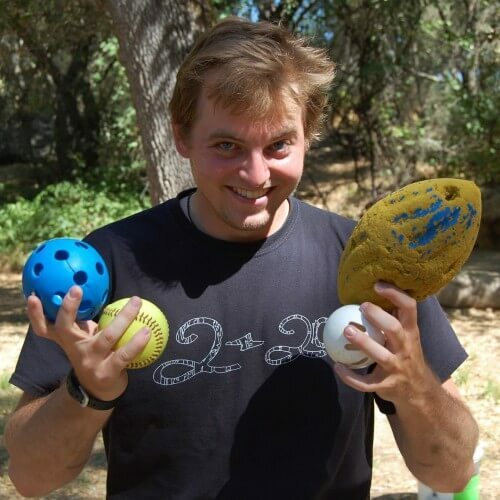 He also was terrific leading team building games, even though some of the kids were not open to the experience. 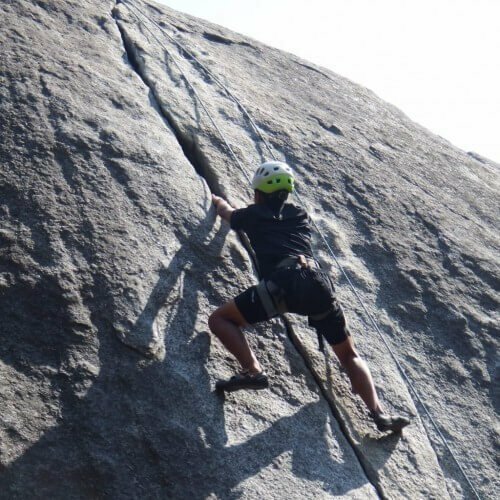 Personally, I felt a little unprepared for the canyoneering, even though I am in fair shape and hike a great deal at home. 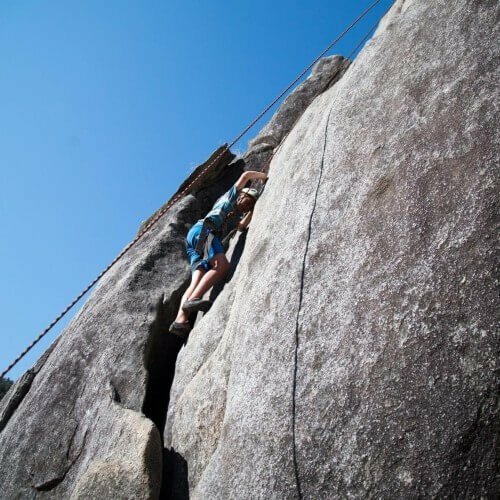 I think the description on the website downplays the rigor of the boulder and rock-walking/swimming portion of the day. I would have invested in better shoes if I had understood the terrain. Otherwise, all staff were friendly and helpful, the food was terrific, and your facility is beautiful. We loved it. Stuart was an amazing guide. He not only helped us tgrough the rafting and canyoneering, but he made such a great effort to get to know each of our kids. He spent a lot of time talking to them about God, and how important it is to be in relationship with Him. He made a great impact. Awesome camp! The staff really adjusts to your needs and has a great air of hospitality. 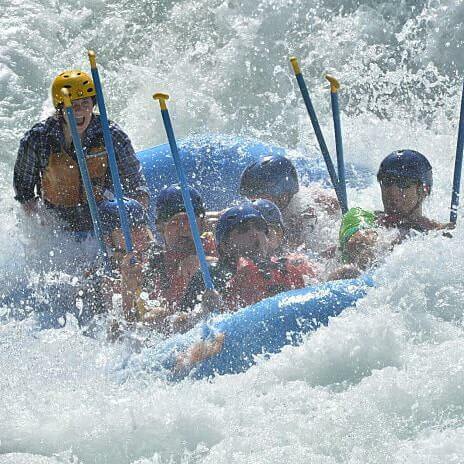 The rafting is a blast and great team building exercises. My daughter has been 3 times, and I’ve been once. It was an amazing experience for both of us! I’ve already recommended it to another church’s youth group! It was awesome! I am no longer active in the youth ministry at my church, but I highly recommend it… There are just not that many older kids in the congregation to make it feasible at this time. You guys are awesome! loved it. especially the enthusiasm of the staff and the “steam rolls”! Our church youth group of junior highers went to Rock-N-Water and had a blast! We had a great time exploring nature and white-water rafting. The youth were able to unplug from all the distractions of the world and really focus on the Lord. Overall, it was the best trip we’ve ever done. We will certainly be coming back again soon!!! Rock-N-Water is a fantastic organization, with great staff and awesome adventures. Highly recommended. Staff are super friendly and fun. Awesome staff and place to minister to people young and old. Highly recommended. 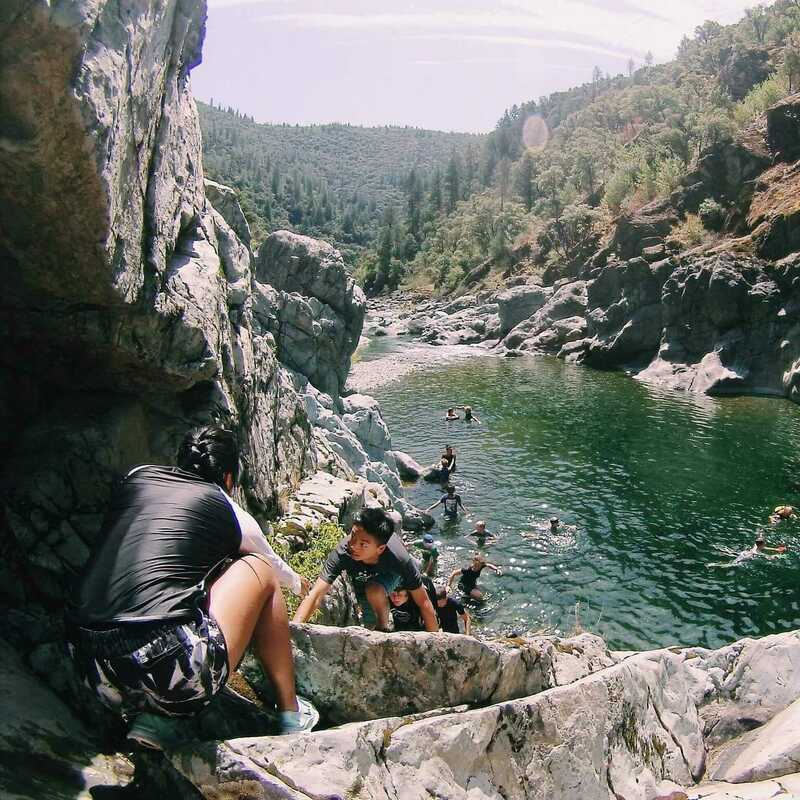 My kids enjoyed their 4th-grade trips, and my cross country runners have enjoyed their Canyon splash weekends. It’s awesome to go to a place where believing in Jesus is cool and where everyone is looking for God in everything they see and do!